A little bit of music history is coming our way. Oddly enough, I have some 78 rpm albums packed in a box somewhere. I got rid of mine. They were "Thick as a Brick". Wasn't there a 16rpm too? Edited 1 time(s). Last edit at 2017-08-14 00:33 by shattered. wow that's amazing, thank you for posting this down here. This is great. Thank you for sharing. This is very cool, thanks for sharing. Hang on to the 78s! God bless Brewster Kahle! The Internet Archive is a treasure. "I'm a bad dream that I just had today and you shake your head and say it's a shame." I read somewhere there were 78 rpm records issued in mid sixties in India. Good Vibratioins by the Beach Boys for instance, I wonder if there was Satisfaction too. Good Vibrations is a 2011 Record Store Day release. I can find no evidence of any Stones 78s. Neither do I. But on this thread there's somebody who claims that at least Satisfaction was released in India on a 78 rpm record. "Many pop and rock stars began their recording careers on 78 before moving onto Ep and Lp. Artists such as Elvis Presley, the Beetles, the Rolling Stones (Indian pressings), the Beach Boys and Ricky Nelson (to name a few), all released or had releases on 78rpms, and it is these early, rarer, unusual recordings which usually command high prices. Early Beetles 78rpms can sell up to and beyond $2000+ (USD)." The only one I can find! Perhaps this one was released after Bill's departure from the band? Ya, good article and thank you RS. Edited 1 time(s). Last edit at 2017-08-15 16:59 by shattered. ...and don't forget the UK 'It's All Over Now' 78rpm on DECCA! I've never heard about this either, from what I can glean the last UK Decca 78 was Bob Cort's Mule Skinner Blues on F 11256 from 1960. Edited 1 time(s). Last edit at 2017-08-16 20:41 by Deltics. I'm not able to post pictures here, but can look at in my book. 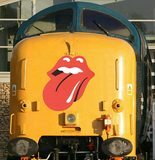 Deltics, picture has been sent, thanks for asking. I've read somewhere that 16 speed was used for speaking albums, although rarely and I've certainly never seen one. I've got a lot of jazz, blues and showtune type 78s that I've bought, shellac, over the last few years from vinyl fairs. Fantastic stuff. I have an old turntable that plays 78s...horrible sound but the sense of history is amazing listening to these records, some over 100 years old.